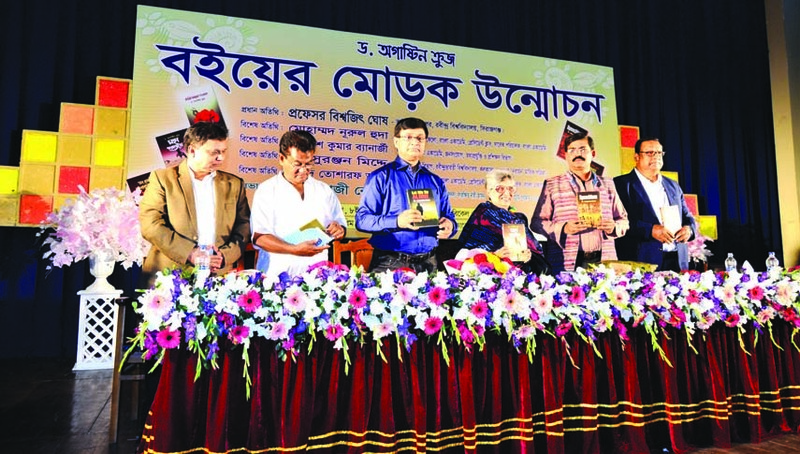 The cover of six books titled Sab Hridoye Valobasa Ase, Akta Komol Golap, Attar Sandhane, Mohaprajoe, Let Me Be Alone and Speechless being unveiled at a ceremony in Bangla Academy premises on Friday. A publication ceremony of six poetry books of Dr. Augustine Cruz was held in the Abdul Karim Sahintya Bisarad Auditorium of Bangla Academy on Friday under the presidentship of poet Qazi Rozy, ex- MP and Bangla Academy Fellow. Eminent journalist and Editor of the Robbar Syed Tosharaf Ali, Oparesh Kumar Banerjee, Director Bangla Academy and Dr. Suranjan Midde, Prof. Bangla Dept. Rabindra Bharati University, Kolkata were present at the function as special guests. Dr. Suranjan Medde told the audience that Dr. Augustine had done a wonderful job bringing out six books of poetry at a time in this Amor Ekushey Book Fair. I am very much impressed to see the huge number of audience in a publication ceremony. It is unthinkable in Kolkata. He claimed that our language, our poetry and our literature are unified. There is no division in it. He also expressed that India is a land of poetry and two famous epic the Ramayan and the Mohavarat were written in Sangskrit which has inspired us all in composing poems. He praised Augustine for his courageous expression on religion and spiritualism. Syed Tosharaf Ali in his speech told that India is blessed by three foreign languages- Sangskrit, Parsi and English. Bengali is enriched by these three classical languages. For that reason, Bengali is a rich language. We are proud of our predecessors who sacrificed their lives to protect the dignity of Bengali language. Dr. Suranjan has said that we have remained united in our language and creations, but I am not in one opinion with him. Due to division our hopes, our thinking and planning has been changed. It is not right thinking to avoid the reality. Mr. Ali told that poet Augustine is a solvent person. But there is pain in his heart, which has compelled him to write poems. He has conflicting thoughts and ideas about life. Something he is guided by science and sometime by religion. He is always taking shelter in spiritualism. He has sufferings and sufferings are required for composing poetry. Poet Kazi Rozi praised Augustine for his outstanding contribution in poetry. Mr. Gabriel Rozario, Coordinator of the function thanked the audience. A cultural function was followed by the discussion.